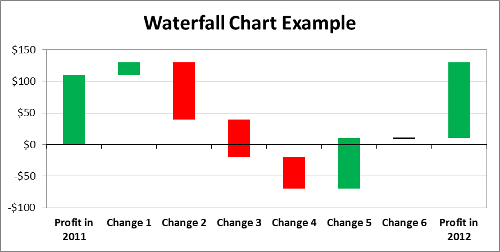 This tutorial shows you how to use the waterfall chart template file Excel that supports negative values and columns representing no change. 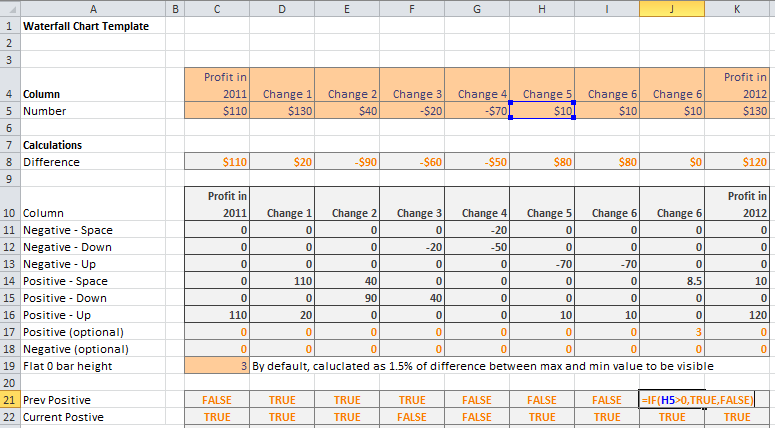 This is the waterfall chart that allows negative values and columns with no change (Change 6). Note that input cells have a orange background and blue text color. How to add more columns? Save the input values on row 4 to 5 so that they can be used later. Highlight entire column I. To highlight an entire column, click on the Column Heading (the letter “I” at the top of the spreadsheet). Highlighting only a part of the column may break the file. This step is really important as it fixes the shifted formula. Highlight all the new columns you created in step 3 to 5 and previous column I (would be shifted to the right so it is somewhere else now). Column formula pasted correctly: The cell is referencing a cell 1 column to the left. Formula not pasted correctly: The reference is to a cell (H5) 2 columns away from it. How to take away a column? Highlight entire column E. To highlight an entire column, click on the Column Heading (the letter “E” at the top of the spreadsheet). Highlighting only a part of the column may break the file. How does it work? What is behind the blackbox? This section is not necessary for using the actual template. But it is useful for those who are curious about how the chart actually works. Each of these series are calculated and shown on row 11 to row 18. The sequence of the rows are opposite from what you would normally expect in the chart. That is because Excel automatically stacks each series bottom first. You can look through each cell to understand how each of the bars (positive – green, negative – red, and the spacer) are calculated on each of those cases. 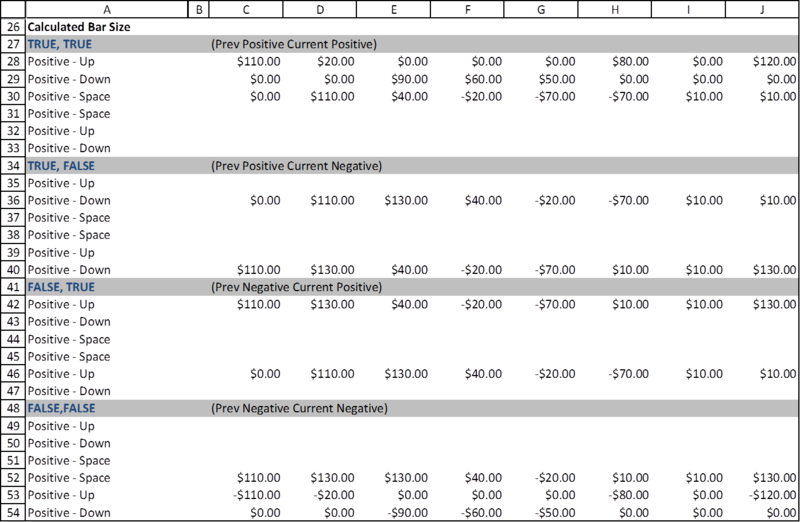 Row 22 then calculates which case to use (1 to 4) based on whether the previous and current values are positive or not (rows 21 to 22). Row 24 indicates if the current value is the same as the previous value, in that case the option bars are used, and all other bars are zeroed out (rows 11 – 18). These cells determine which section of bar lengths should be used. There you go! Hope you enjoyed this brief tutorial and find the template useful. This entry was posted in Charts, Downloads, Excel, Excel 2003, Excel 2007, Excel 2010, Popular. I’d suggest that this would be more useful if the inputs were the differences. Not many people will start off having the data for the number row; they are much more likely to have what now appears in the differences row. Lotusaurus, I’d say it depends. 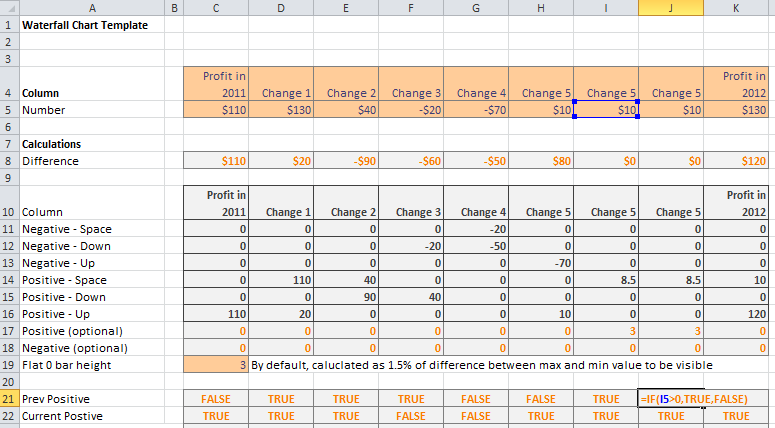 However, this can be easily worked around by having the differences on the sheet, and calculate the values by adding the differences. Is there any way to fix the data labels? When I add data labels for the bars that are in red, it comes up with “0” as the data label. The green labels work fine. This was outstanding. Thank you so much! This is awesome. I appreciate the work.!! This does not seem to work well when the first value is a negative. Is i possible to send you my file and let me know if it’s anything I’m doing wrong? I’ve followed your directions meticulously and validated the formulas are populating correctly. Also – I could be wrong – but are the titles (first column) of the last sections of the document labeled wrong? I don’t see any values starting with ‘Negative’. Possible to change from $ to a other currency? I have come across many waterfall templates and this is one with a easier to use interface. Well done! Have you tried to make a clustered stacked waterfall? Nanis, that sounds like a worthy challenge and will be my winter project. Great functionality, thanks for sharing. Couple questions 1) should the last bar should go from 0 to final value? currently it is floating in the example file. Fix: zero out cell O12. 2) is Row 4 mislabeled? it says ‘changes’, but it looks to be the moving totals, or cumulatives.